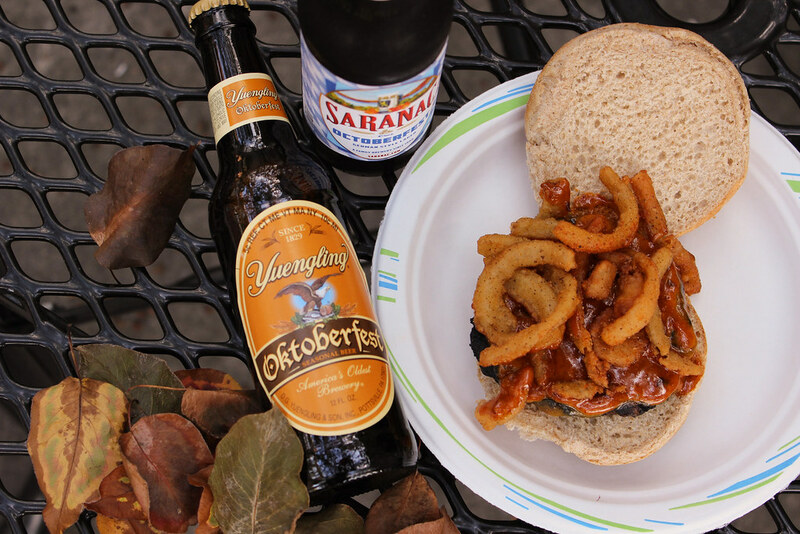 Taking on-campus favorites to a 21+ level. This time of year can be stressful, what with those pesky midterms right around the corner, and getting off campus to enjoy a meal can be even more difficult. While the first few weeks of school brought little to no work in addition to off-campus wining and dining, it looks like The Commons, Starbucks and Rocky’s will be your go-to-grub for now. Although it can be daunting knowing that the most you will commute in any given day is back and forth from Wilson Commons, I’ve got a solution. Last week, I set out on an expedition with the help of the lovely photographer, Viola, to obtain six of the best autumn beers to pair with some Commons favorites. The beer contenders were as follows: Yuengling Oktoberfest, Saranac Oktoberfest, Samuel Adams Oktoberfest, Shiner Oktoberfest (I’m sensing a trend with the name here), After Rakin’ Autumn Ale and Blue Moon Harvest Pumpkin Ale. On the food side we have: the Mel Burger (sans cheese), sweet potato fries (a new ticket item), buffalo chicken meatballs and last but certainly not least, a Panda bowl from Panda Express with fried rice and sesame chicken. Here’s how the contenders line up. Both beers had similar hoppy notes that were needed to take on the challenge of facing the highly esteemed Mel Burger. Each slightly sharp sip of the beer was able to cut through the sweet notes in the Mel Sauce and create a killer balance. Maybe it was just the clever title that attracted me to the After Rakin’, but this beer paired extremely well with the sweet potato fries. 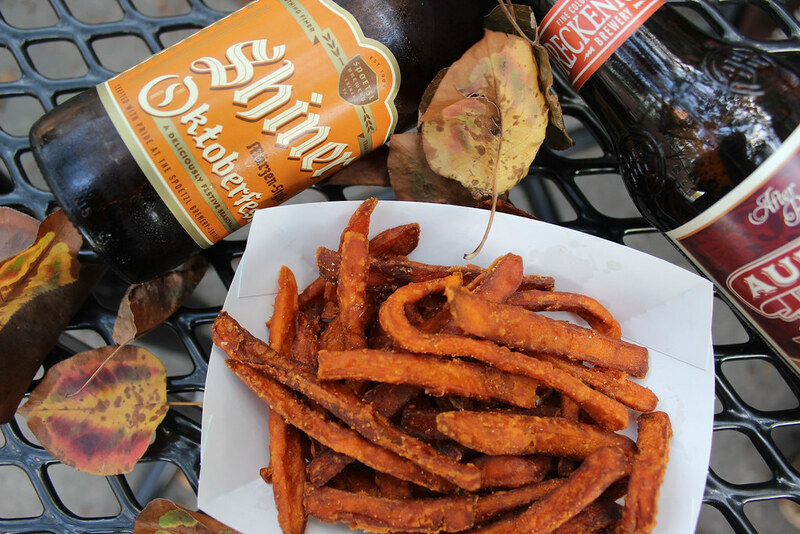 The rich taste of both this beer and the Shiner harmonized with this deep-fried snack to deliver a hearty pick-me-up that was much needed after a long day of “raking leaves,” a.k.a. sifting through the pages and pages of notes you need to review for your upcoming midterms. Sure, you could say I’m biased towards the Sam Adams, being Boston-born and bred, but sometimes you just can’t beat a classic. 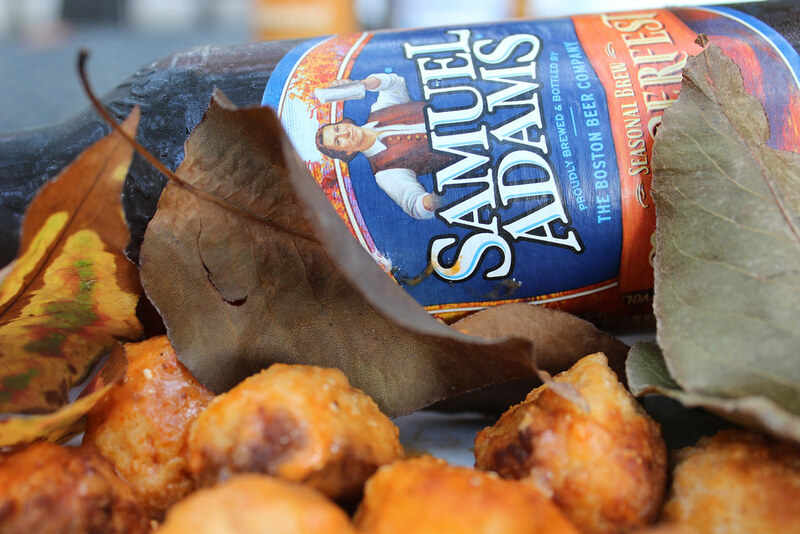 The Sam Adams was able to counteract the heartier (and spicier) dish by providing a refreshing sip between bites during our brisk afternoon picnic. As a new menu item, the meatballs were also a hit among our panel of two. The Panda Bowl was a tricky item to pair, as it had many components. The sesame chicken had sweet notes that would work well with hoppy pale ales, yet the salt from the soy sauce yearned for a beer capable of quelling its sharpness. 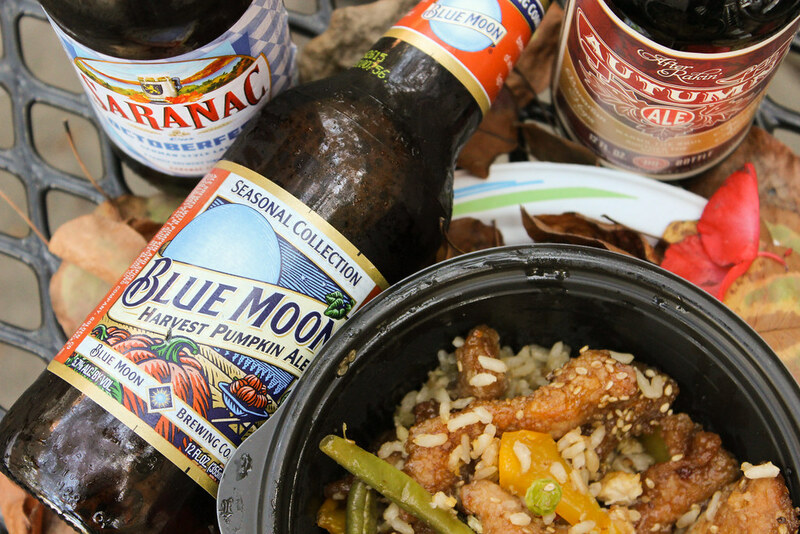 As a result, we paired the bowl with a few different beers, with our main focus on the Blue Moon Harvest Pumpkin Ale. This beer is versatile in that it’s not too heavy or too light (probably would be Goldilocks’ choice as well) and can be appropriately paired with many types of food. Now it’s time for you to go out and grab a case of your own and take some of your local fares up a notch. Before you know it, we’ll be headed into winter and spiked hot beverage season, but hey, there could be worse things in life.